Talk and Q&A 5.30-6.15pm, followed by light refreshments and the opportunity to talk further with Gerald Hensley. Join us as Gerald Hensley, in conversation with journalist Richard Harman, tells the inside story on what happened when the Labour government's "nuclear free" policy collided with a US foreign policy based on nuclear deterrence. 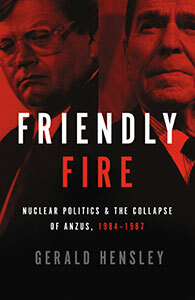 His new book, Friendly Fire: Nuclear Politics and the Collapse of ANZUS, 1984–1987 (AUP) is a definitive account of a key turning point in New Zealand history involving ship visits denied, angry meetings, fraught diplomacy and free-wheeling press conferences, culminating in the unravelling of the ANZUS military alliance, established in 1951. Gerald Hensley (right) was a participant in these events as head of the Prime Minister's Department. 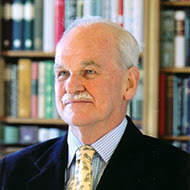 He has drawn on his personal knowledge, interviews from key players around the world and previously classified government files in New Zealand, the US, Australia and Britain, to guide us through the complex play of cultural loyalties, strategic objectives, and personal relationships that led from policy differences to confrontation to collapse. Please join us on Wednesday 5 June to hear Gerald Hensley's talk "Friendly Fire: what happens when allies quarrel"
We look forward to seeing you on L4, ASB House, 101 The Terrace - the talk starts at 12.15pm.